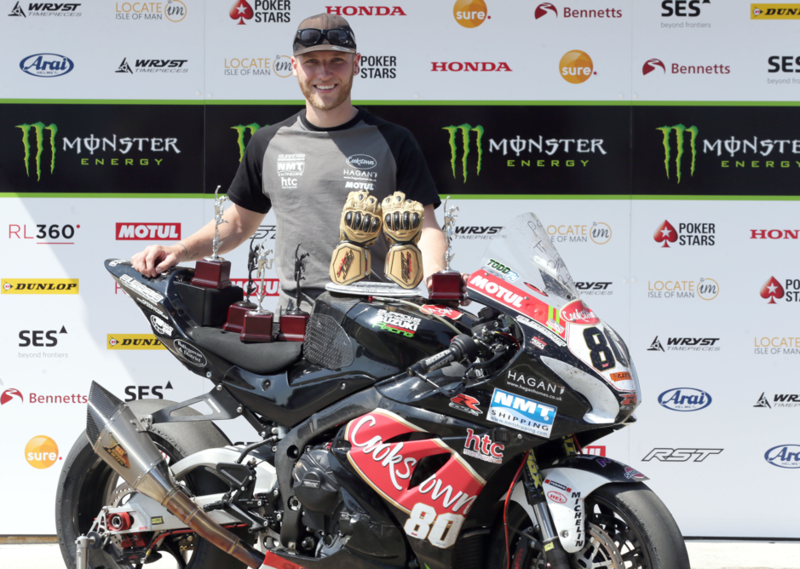 Cookstown Burrows Engineering’s rising star Davey Todd is set to make his racing debut on the Colas Billown Course at this year’s Isle of Man Steam Packet Company Southern 100 International Road Races next month. Races put him 26th overall in the Duke Road Race Rankings Championship and second highest Newcomer. Astute sponsor and mentor, John Burrows wasted no time in the ‘closed season’ and brought the rapidly rising star into the Cookstown Burrows Engineering Road Race Team. Davey Todd’s first outing on the well-prepared Burrows machines saw him take three top-ten placing and a podium third at the opening road race of the 2018 season, the Cookstown 100. A week later at the Tandragee 100 Road Races Davey got a seventh in the Championship Open race. place in both Superbike races and 13th in both Superstock events – a very positive outcome before the team travelled across the Irish Sea for the Isle of Man TT Races. finish in the Superbike TT and his first Bronze Replica and followed that with two 12th places in the Supersport races and two Silver ladies. Finally, in the ‘blue-riband’ Senior TT, a magnificent ninth position was the result of six hectic laps, some 226.38 miles and his second Bronze Replica. 22-year-old Davey Todd became the fastest newcomer of the 2018 Isle of Man TT Races and the second fastest ever newcomer, behind one Peter Hickman and collected the much-coveted Privateers Championship at the end of the 2018 TT. The Cookstown Burrows Engineering Team is now preparing for their next International Road Race of the year, the Isle of Steam Packet Company Southern 100 International Road Races, where Davey Todd will be astride the immaculate Suzuki Superbike and Supersport machinery. Davey, maybe making his debut on the tight and demanding 4.25-mile Billown Course, but his form since making his road race debut twelve months ago will not only make his fellow competitors but also many race fans keep an eager eye out for the combination of the distinctly liveried Burrows machines and rider Davey Todd coming through the pack aiming for the chequered flag! Team Manager, John Burrows said: ‘Many thanks to the Southern 100 club for making this possible so that Davey Todd can make his first appearance at the Billown Circuit. ‘I personally have many good memories from riding with the club, having won a Superbike Race on this circuit back in 2009 the day after the TT. Report courtesy of Burrows engineering.